A picture of a small Shasta Daisy in full bloom which blocks the view of a lighter colored flower at the Garden of Innovations at the Montreal Botanical Garden in Montreal, Quebec. This picture of the Shasta Daisy shows how some of the petals can have a yellowish tinge to them while others can be white but the centre on both flowers is bright yellow. 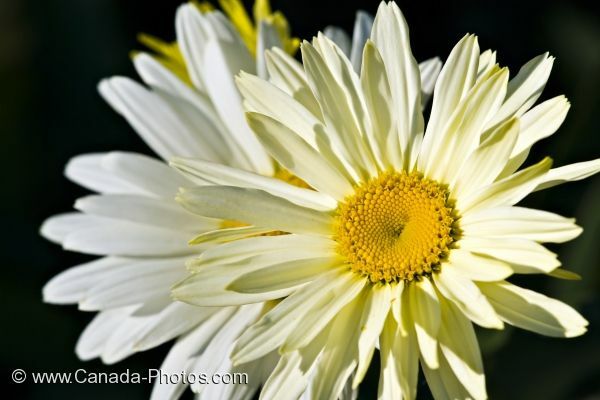 The Shasta Daisy is a very easy type of flower to grow and many people love to have their bright colors flourish in their gardens, but these ones are on display at the Montreal Botanical Garden in Quebec, Canada. Leucanthemum maximum, in the Garden of Innovations at the Montreal Botanical Garden, Jardin Botanique de Montreal, Hochelaga-Maisonneuve, Montreal, Quebec, Canada. Picture of a beautiful Shasta Daisy in full bloom at the Montreal Botanical Garden in Quebec, Canada.